The Navy was not on Capt. Anne Fischer’s radar until her third year of law school, when she noticed a sign-up sheet in Green Hall announcing a visit from a JAG recruiter. More than two decades later, Fischer is still loving it, and still serving. 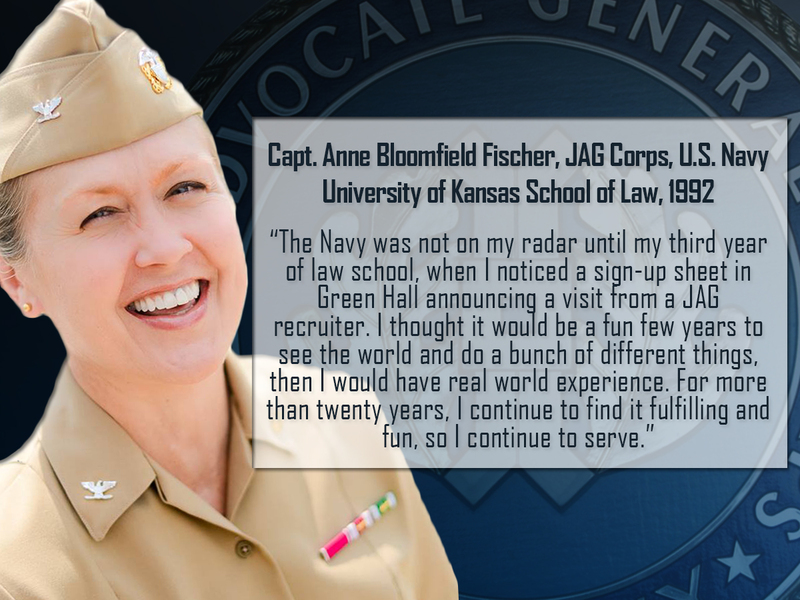 After finishing law school and passing the bar examination, Fischer completed Navy officer and legal training in Newport, Rhode Island, then reported for duty at the Navy’s legal services office in San Diego. While teaching at the Naval Justice School, Fischer also served on the Defense Institute of International Legal Studies (DIILS) mobile education teams. The teams, composed of members of all branches of the military, work with partner nations to build capacity and implement democratic rule of law and equitable military justice systems. Fischer later served on a mobile education team to Mozambique, a former Portuguese colony that was recovering from a protracted civil war and transitioning from a Marxist regime to a democratic system. The DIILS training seminar introduced the Mozambique Armed Defense Forces to the concepts of the rule of law, human rights and civilian control of the military. It also provided an opportunity for rival factions within the military and civilian leadership to come together and discuss their differences and build relationships. Fischer gave presentations on the U.S. military justice system and facilitated interaction between the Mozambican participants. After three years stationed in Italy, and another three years working for the commander of the Navy’s west coast ballistic missile submarine fleet near Seattle, Washington, Fischer is currently based in D.C. There she has worked at the Washington Navy Yard and in the Pentagon in legislative affairs and as executive assistant and special counsel to the General Counsel of the Navy. The Navy offers post-graduate education for lawyers in three areas: international law, environmental law and trial advocacy. Fischer took advantage of the program to earn an LLM in environmental law from the George Washington University Law School, and put her environmental expertise to work on Capitol Hill. The effect of Navy sonar training on marine mammals was a hot-button issue while Fischer was working in legislative affairs, and she used her expertise in environmental law to address the concerns. The Navy has specially trained marine mammal lookouts on all vessels equipped with sonar and follows stringent mitigation measures to avoid marine mammals during training exercises, Fischer said. “These measures are effective in preventing impacts to marine mammals.” On the Hill, in the courts, and in the press, Fischer played a key role in the Navy’s ability to inform and successfully rebut challenges to Navy operations. Fischer currently serves as the Staff Judge Advocate (SEA 00J), Naval Sea Systems Command. –By Emily Sharp. A previous version of this story appeared in the spring 2015 issue of KU Law magazine.